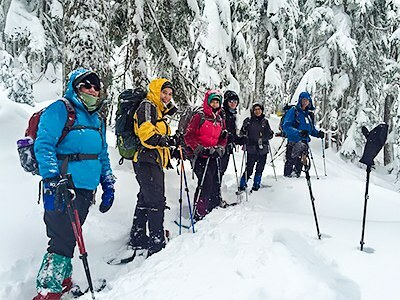 Field trip for the Seattle Basic Snowshoeing Course. Check in at the upper parking lot of the Stevens Pass Ski Area by 8:00am. The field trip is your opportunity to practice the techniques presented in the lectures and reading material under the guidance of experienced instructors. Each field trip covers material in a limited amount of time. Prepare for the field trip. Review lecture material, reading material and handouts. Be prepared for a full, long day at the field trip. Don’t bring family, friends or pets. Arrive early enough to park and make whatever preparations are necessary so you can be ready to begin at the starting time. It is recommended that all field trip participants try to carpool. See How To Opt In For Carpooling. Please remember that your instructors and leaders are all volunteers. They all have something to teach you and deserve your attention and courtesy. Everyone is there to help you and to answer your questions – the only foolish question is the one not asked. Note: It is Mountaineers policy that alcohol and controlled substances may not be used before or during club tours and field trips.